nthly lunch meeting and talk of 2013. 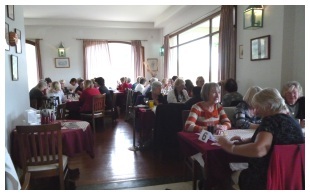 There were 50 ladies present at this month’s lunch and we all settled down at our allocated tables to enjoy the good food served by Club Ilgaz. The organisers like to move everyone around each month so we all have a chance to meet some new people and this is a great idea. There were 6 ladies at our table, some I knew and some were new faces so it was nice to make some new acquaintances and have a chat. was there with his daughter and one of his stylists. I managed to have a quick word with him prior to his talk and he told me that his salon was opened in May 2011. 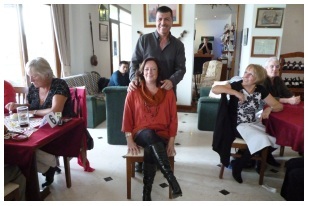 He was born in Cyprus but has spent 39 years in the USA, 37 years of which he has been in hairdressing. Hasan had previously studied computer science but he decided not to go ahead in the computer world and turned his sights to his passion for hairdressing so with 37 years behind him he must know a lot about hair. everyone and said she had great pleasure in introducing Hasan Karagözlű to speak to us. Hasan started his talk, telling us about his salon and inviting us all to visit. The salon has been open for 2 years in May and is very tastefully laid out with an area at the rear where clients can relax during their hair treatment. Hasan explained how important it is to get to know a client and establish what it is they want in terms of hairstyles and colours. He went on to emphasise how important it is to use the right hair products depending on the type of hair which at the end of the day has an effect on whether the style will look good or not. Hasan talked about “bad hair days” which he thought every one of us must have experienced at some time. with long hair to come and assist him to explain how he would go about cutting long hair to a shorter style, which maybe the client hadn’t really thought about in great detail, and the affect it could have on her features. So Hasan demonstrated how he would show the client by pulling the hair back and also showing a side view. This is where an experienced hairdresser would not simply follow instructions and cut the hair short, he would try to show what the end result would be before starting. We were advised as to the best products to use and the advantages of using the right treatments for various types of hair and there were some products and treatments on display which were explained to us in great detail. y interesting and enlightening talk. 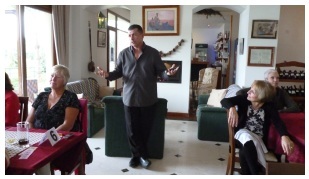 Following the talk the raffle took place which this month was in aid of the Children in Need Foundation. 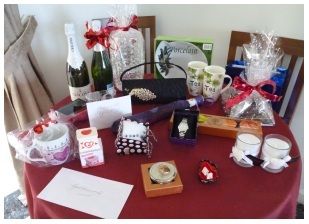 There were some lovely prizes on display some of which had been donated by members of the lunch group. At the end of the afternoon we were told that the amount raised from the raffle was 367TL which was a very good result for CINF. So, the afternoon was over and we all look forward to the next lunch which will be held on the first Tuesday in March. 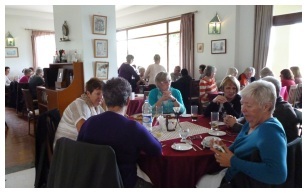 It was a super lunch at the Ilgaz Club as usual, and the talk was very good. Thanks for the comment. Yes it was really good as usual.